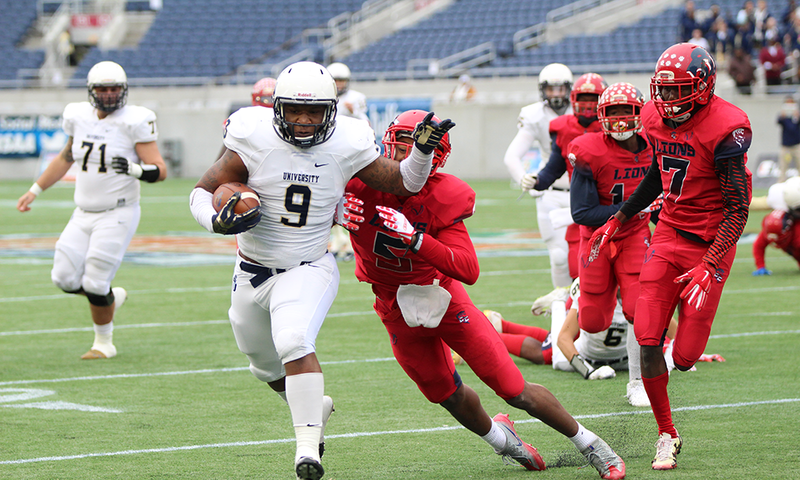 ORLANDO, FL — If you were looking for anything to do with the offense in the 2016 Class 2A FHSAA Football State Championship, then today was not your day at Camping World Stadium despite the University Christian Fighting Christians walking off with a 24-8 victory over the Champagnat Lions. The win for University Christian gave them their second straight state championship, their third in four years and their ninth overall in school history. From the moment the game kicked off, it was the defense that came out to rule the game between both teams as Champagnat (12-1) ended up punting on the first two drives while University Christian (10-2) gave the ball away to the Lions on a fumble on the first drive. The first score of the game though finally came through with 2:06 left in the first quarter when Sami Safar knocked in a 32-yard field goal thanks to a bounce off the post. That score was set up thanks to a short punt from Champagnat’s second drive that gave the Fighting Christians great field position. After the field goal, it really became a defensive battle as Champagnat saw their next drive end a punt while University Christian couldn’t convert on fourth down on their next drive. Early in the second quarter, an interception by the Fighting Christians’ Dyrell Stubbs provided some hope to give the team a spark, but things didn’t get going much after getting a few first downs and the drive ending in a punt. After another punt by Champagnat in giving the ball back to University Christian, but an interception by cornerback De’Vante Mitchell gave the Lions some hope to do something with the ball. However, that proved to be for naught as they ended up punting again. As the first half came to a close, both teams exchanged punts as the first half came to a close with University Christian still up 3-0. With the second half underway, things were looking quite the same as both University Christian and Champagnat exchanged punts once again on the first four drives. However, within a matter of 20 seconds, Champagnat’s Isaiah Sharpe intercepted a Clayton Boyd pass, but on the very next play, a fumble by Calvin Montgomery gave the ball right back to the Fighting Christians. The fumble by Champagnat gave University Christian great field position in possibly capitalizing on getting more points, but that wouldn’t be the case as Safar missed his second field goal attempt of the day, this time from 36 yards out. With another quick three-and-out though for Champagnat, University Christian made good this to make sure as Leon Huey returned the short punt of 8 yards for a 27-yard touchdown to put the Fighting Christians up 10-0. Going into the fourth quarter, Champagnat knew it still had a chance to be in the game and knew that time was eventually going to start to turn against them. However, with the ball in possession the Lions got down to the University Christian 14 before turning it over on downs. University Christian couldn’t make much of moving the ball down the field on the next drive and was forced to punt. However, a block on the punt by the Lions with a recovery and return by Gregory Rousseau to the University Christian one-yard line gave the Lions another to make it a game. However, it wasn’t meant to be at Champagnat first got moved back due to a delay of game penalty and then a fumble on the play that forced by University Christian’s Huey, that was recovered by the Lions. The next play though is when Stubbs intercepted his second pass of the game that would set up the Fighting Christians’ next scoring drive that saw a fake punt on fourth down and capped off with a five-yard quarterback sneak from Boyd to put University Christian 17-0. University Christian scored once more on a 49-yard fumble recovery by Leon Huey to take a 24-0 lead before Champagnat finally scored their lone touchdown of the game with 35 seconds to go to make the final score 24-8.